Living in Iowa, the most common roofing concern we face is ice damming. You know what I’m talking about, those HUGE piles of ice and snow that build up on your roof leaving gigantic icicles and pull down your gutter. 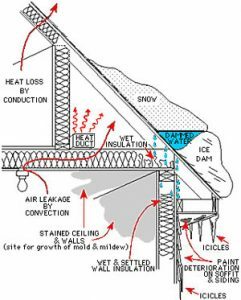 More specifically, an ice dam is a ridge of ice that forms on a roof which prevents water from being able to exit the roof. The excessive buildup is not only extremely heavy, but can also cause damage to gutters, ceilings, walls, and insulation. The Cause. Most ice dams are caused by improper ventilation. Or maybe it’s lack of insulation. Roof and Soffit vents work with attic insulation to keep the surface of your roof cold in the winter and hot in the summer. Oftentimes, a roof is unable to “breathe” due to blocked vents, or an inadequate amount of ventilation. The Solution. Intake vents (vents located in the soffit or at the base of the roof) can be blocked from the outside due to painting, or from the inside due to insulation. More frequently the property doesn’t have enough intake (Soffit Vents) and/or Exhaust (Roof Vents). There are many easy ways to remedy a blocked vent. The least costly solutions include removing and replacing soffit vents that have been painted shut. If the soffit vent is blocked from the inside, remove the excess insulation and free the airflow. Once your intake vents are clear and free flowing, it’s time to move to the roof vents. Some roof vents are box shaped, some are circular, and some are located under the shingles on the ridge of your roof (Ridge Vents). These vents help outside air move along the underside of your roof, keeping it cool. The colder your roof, the less likely you are to have ice damming. In some cases, the original vents do not allow enough air to escape the roof. This problem can be remedied by installing power vents or installing a ridge vent conversion. A power vent is simply a vent equipped with a fan to remove air from the space. A ridge vent is a product that is installed on the peak of a roof allowing maximum airflow for the space. While ice damming is potentially detrimental to a roofing and framing system, it is always best to address the issue when conditions are safe. Vents should always be installed on a dry roof, preferably during warm weather. Anytime you climb onto a roof, there is potential for danger. Keep it safe. Always consult a roofing professional regarding your concerns and project before climbing your roof.